Zionist Camp Chair speaks before hundreds of young Jews in London, refers to party's situation and confrontation with Netanyahu. 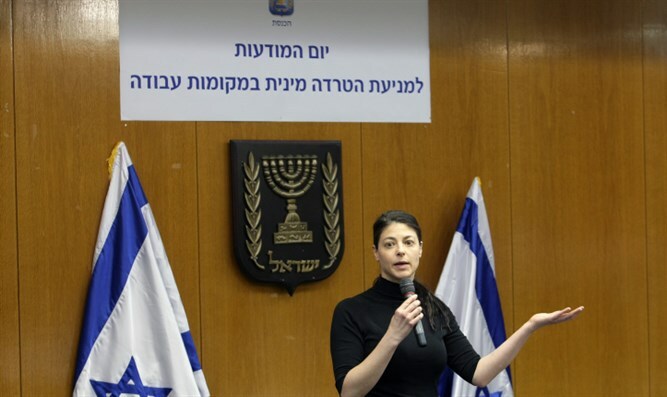 Zionist Camp faction Chair Merav Michaeli spoke last night (Saturday) at the Limud Former Soviet Union (FSU) conference in London attended by 700 young Jews, and referred to her party's situation in the polls. "Herzog is among the contributors to the Zionist Camp's state. He is the leader and has responsibility for what the party has done and where it is going," said Michaeli. Michaeli added that it is yet early for her to take a public stand on the subject of primaries, and that "in any case if we as a party want to move and arrive somewhere, we have to learn to be united and present a united front. "I would not rule out running for party leadership in the future," Michaeli said, "All the portfolios interest me, as my feminist vision is relevant to everything - the Justice portfolio, Education. The Defense portfolio - certainly not in the first stage." Relating to the political program presented by party member Amir Peretz, Michaeli said, "One of the things we became addicted to is internal party negotiations. Amir Peretz's plan is irrelevant so long as we are not in power, although it is very serious." Michaeli also referred to Israeli Prime Minister Binyamin Netanyahu, "Bibi is a talented genius, but he uses his abilities in a very bad way. "I do not think that Israeli citizens went right. I think they were brainwashed," she added.